When we look at the pair *-mén(i)/*-tén(i), the so-called plural *-n- appears to be only explainable as the product of analogy with early MIE 3pp ending *-éna before the time when *ta “that” (> PIE *to-) was employed to extend the 3rd person singular and plural endings. This termination may once have spread from the third person plural active to the rest of the plural terminations at an early date. QAR predicts accent on *e and the etymology of these endings is transparent indicating that *-mén(i) and *-tén(i) date to at least the Mid IE period before Syncope had yet to take effect. Now, if we know that *-mén(i) and *-tén(i) are quite ancient, it follows that the accentuation of *-més and *-té can be explained as analogy with older *-mén and *-tén. However, the lack of *-i in primary *-més and *-té still begs an answer. Logically, whatever the source of these unextended endings, they must have once had no need for the indicative *-i. This may indicate a particular usage outside of the primary conjugation. I believe that a possible reason for this is that these latter pair of endings were taken directly from the independent oblique plural pronouns of the time: *mes and *te. MIE enclitic *mas regularly becomes *n̥s via Syncope, and was then later extended analogically as *nos by the time of PIE proper. MIE 2pp oblique *te however (*tei in the nominative case) was replaced in the meantime by an inanimate noun *yáuas “(the) group” (> early Late IE *yaus), thereby obscuring the ultimate source of later 2pp ending *-té. If this is all correct, it's then probable to me that these alternative endings were first coined as early as the late Mid IE period and that dialectal replacement of *-méni and *-téni by *i-less, pronoun-derived alternatives *-més and *-té began to spread during the Late IE period. ... Or is it?! Alas, my work is never done. Happy Halloween, everyone! The basic root *yeu- "to bind, join together" is acknowledged in Mallory/Adams, The Oxford Introduction to Proto-Indo-European and the Proto-Indo-European World (2006), p.522 (see link). It is also deemed the underlying root of extended *yeu-g- with identical meaning which is the source of inanimate thematic *yugóm "a yoke" as expounded upon by Szemerényi, Introduction to Indo-European Linguistics (1999), p.272, fn.10 (see link). My goal in this latest blog rant is to find a pleasing reconstruction of the Old IE (OIE) objective conjugation, that is, the antecedent of Proto-Indo-European's (PIE) *mi-conjugation. I'll be referring back to Pre-IE sound changes as I've defined them in my online pdf in order to find my solution. Before we can arrive at a solution, however, we must piece together what happened with the first and second persons plural endings. I guess to keep this topic together, we first might peck off a few options of possible ancient protoforms. Here we go. The first, most obvious post-IE innovation is *-mosi/*-mos/*-mo as might be based on Latin -mus or OIr. -m, for example. This must be a new phenomenon that, at the very least, postdates Schwa Diffusion since in order for *o to have developed in an unstressed syllable, *s would have to be voiced at the time. Yet, this is not possible because we know that the plural had unvoiced *s throughout the Late IE period, that it was unaccented and that its preceding vocalism was *e as a result. Likewise, just in case some may think that *-mes was instead the product of 1ps *-m and 2ps *-s “you” (i.e. “I and you” → “we (inclusive plural)”), the same problem arises and *e is yet again the expected vocalism since it is afterall what is found in the 2ps thematic presentive ending, *-e-si (never **-o-si). So no matter how you slice and dice the 1pp ending, forms like *-mo[s(i)] must be patterned on something else, something later. Indeed, it is no doubt affected by the independent pronoun *nos “we” (in turn a late derivative of unaccented PIE *n̥s < MIE *mas). Surely this is a post-IE form and has no bearing on PIE, let alone Pre-IE. So let's toss these endings in the trashcan straight away! Next up are the 1pp variants *-més/*-mé and 2pp *-té. In this grouping, we observe an accent that should not be there since etymologically speaking, the 1pp ending is surely nothing more than *-me- [first person pronominal stem] and *-(e)s [plural]. Judging by QAR, the plural marker was unaccented because it contained no word-final vowel in the stages preceding Syncope . In other words, even before Syncope, *-as was the MIE plural ending, not **-ésa. Further, this word-final *s is testimony to a most ancient event which I call Indo-Aegean Sibilantization. Ultimately this plural is related to Uralic plural *-t. The sibilantization of early Indo-Aegean *t would not have happened unless *t was word-final at the time (n.b. Sibilantization also explains the origin of *s/*t-heteroclitic stems in PIE like participles in *-wos). Subsequently as a result of a lack of word-final vowel in the Mid IE (MIE) plural, the plural could never have been voiced to **-ez in the Late IE period. Yet... we find accented athematic presentive 1pp and 2pp endings nonetheless. Why??? How??? And if the primary form were *-mési and secondary were *-més, then despite unexpected accent, the source of the pattern might be a little more transparent. However, the primary form was apparently *-més without *-i and the secondary was *-mé. The absence of *-i in the primary marker adds to the strangeness but it might suggest an archaicism. The loss of *-s in the secondary is no doubt by analogy with other late innovations such as the secondary middle endings with its similar loss of *-r ultimately inspired by the inherited loss of final *-i in secondary active forms from pre-IE times. At first glance, it's impossible to tell what exactly was going on with this particular group of endings because of a few things obscuring the problem, so let's move on and come back to this group of endings later on. Next up: the *-mén(i)/*-tén(i) group. More later. I'm still thinking about a problem that I've never completely solved to full satisfaction yet so it's a good topic to amble through right now. It seems to me that the singular personal endings are easy enough to work backwards into Pre-IE. In the most ancient stages of Pre-IE, there must have surely been two completely different sets of endings, one used for objective/active (i.e. the *mi-set) and the other for subjective/stative (i.e. the *h₂e-set). It's safe to say that the *-t- of the 3ps and 3pp active is merely an eroded form of deictic stem *to- which was attached before the Syncope rule. This ending must have then been fully entrenched in the language by late Mid IE. So far then, this leaves me in Old IE with objective singular *-em, *-es and *-e and subjective singular *-xa, *-ta and *-a. There may also have been a special stative set: *-x, *-t and *-0. The later so-called indicative *-i (or should it be renamed declarative?) must have been agglutinated to the existing objective endings in Mid IE at the time of QAR (Quasi-penultimate Accent Rule). So what's so problematic? Well, look at how the 1pp and 2pp active endings are reconstructed for later Proto-Indo-European (PIE). The 1pp primary ending is apparently a slight embarrassment of numerous parentheses: *-mé[s/n](i). That is to say, it could be *-mé, *-més, *-mési, *-méni or all of the above for all we know. The secondary ending is supposed to be *-mé, or possibly *-mén, or maybe even *-més. Egad! The 2pp is also idiosyncratic because for some IE dialects, specifically the "internal IE" dialects, *-té must be prescribed for both the primary and secondary conjugation in the parent language (as well as for the 2pp imperative) while in other branches such as Anatolian, primary *-téni and secondary *-tén seem more in order. Despite the madness, we can thank our lucky stars that the athematic primary and secondary 1ps, 2ps, 3ps and 3pp endings are securely reconstructed as *-m(i), *-s(i), *-t(i) and *-ént(i) respectively, but the 1pp and 2pp endings are our bratty problem children. Now, with that intellectual teaser, perhaps we should start trying to figure out what is going on with these two persons. Which variants of these endings are more archaic? Or are they all the same age? What should we reconstruct for the Old IE stage? What is the significance and origin of this *-n- plural marker in some dialects that replaces the far more productive plural ending *-(e)s? Why isn't the deictic *-i attached to the 1pp and 2pp primary endings in some dialects? And why isn't the plural marker *-(e)s attached to the 2pp as it is in the 1pp? So many questions, so few answers. But don't worry. Glenny's been thinking very long and hard in the past week about this. I believe I have some solutions that I will share in subsequent blog entries because this is a large topic with lots of grammatical details to juggle. Stay tuned. Here it is. A new version of my original pdf listing possible Proto-Semitic loans in an early stage of Proto-Indo-European. Hopefully, many of the errors in the first draft have been ironed out to everyone's satisfaction. The so-called imitative status of PIE *pneu- "to sneeze"
I don't have a lot of time to talk, folks, so I'll be brief about something bugging me lately. Recently, Bradshaw of the Future wrote in the article Sneeze and pneumatic about the origin of "sneeze" in PIE *pneu- calling it an imitative root. This is in fact a common description of this Indo-European root. However the question I'm posing here is: How do we really know that this is an imititative root? The cold truth is that we don't. We only assume this to be true because of the semantic nature of the verb. So we should be cautious to distinguish solid facts from these sorts of unverified or unverifiable assumptions. I mean, I don't know about any of you, but personally my sneezes never sound anything close to "pneu". I've been exploring an alternative origin of this word, not from an echoic origin, but rather as a possible Semitic loan. I've mentioned before in Pre-IE Syncope and possibly expanding the Metathesis rule that there may be some loans from Proto-Semitic that exhibit word-initial metathesis of consonants in PIE after experiencing the event of Syncope. Metathesis is one common tactic for renormalizing syllable structures after awkward clustering is caused by the disappearance of unstressed vowels. Such metathesis is guided by a universal rule in world languages known as sonorancy hierarchy. Certain clusters are universally avoided such as *rp- or *bft- for example. So if it's generally accepted that Pre-IE must have undergone Syncope, then it's naturally implied that awkward clusters like this should have occasionally arose and that there must have been a mechanism in place to restructure these roots. This would then become late MIE *nᵊpéwᵊ- (via Reduction) and then *pneu- by early Late IE via phonotactically motivated Metathesis in order to avoid the less desirable outcome of **npeu-. Enjoy that thought. I know I do. It seems that, in all the immense details that I've deduced over the years on Pre-IE, I forgot about Thematicization which is what I call the point at which productive animate suffixes were derived from their inanimate counterparts by infixing a vowel schwa during the middle of the Late IE Period. I presume that the reason for this infixing is not because the schwa was an actual animatizing morpheme but rather by analogy with the fact that most animate stems happened to be thematic (i.e. stems ending in a schwa) while inanimate stems tended to be athematic (i.e. stems ending in a consonant). I want to talk more on this because it relates to the eventual development of feminine gender in Post-IE dialects. That is, out of the ancient inanimate collective *-h2 would be forged a new animate collective *-eh2 that would later be used as a feminine marker. This also relates to the origin of Indo-European s-stems that Phoenix has recently been pondering on (and which made me ponder on lately). (14 Oct 2008) Whoops, a teensy typo to fix in the text above. The phrase "while inanimate stems tended to be inanimate (i.e. stems ending in a consonant)" should have read "while inanimate stems tended to be athematic (i.e. stems ending in a consonant)." I have no clue what the plot of this movie was about but I'm mentioning it nonetheless for the sake of its polyglot content. 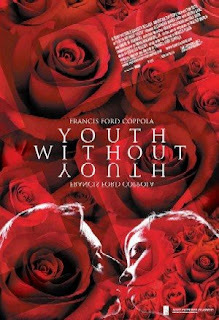 Created by Francis Ford Coppola (the guy who made Dracula in the 90s), the main plot of this film appears to be about a septuagenarian professor nearing the end of his life who is attempting to finish a book about the origin of language. He gets struck by lightning, coincidentally on the day of Easter (which I assume is some sort of rebirth symbolism), and is somehow, to the amazement of the doctors, rejuvenated into a man appearing only 40 years of age. Crazy already, quite obviously. But if you think that's strange, the rest of the movie devolves into an even bigger cacaphony of plot twists and contrivances that'll blow your mind. Yet strangely, as I was watching it, I remained intrigued enough by the main character's insane journey to finish it. It even caused me to ponder on Coppola's purpose of the film days later. It's the kind of film that, despite being erratic and seemingly nonsensical, is still sufficiently crafted to make the inquisitive sort like myself to wonder if they'd missed something in the translation. Those who love the sounds of various languages will at the very least keep amused while attempting to identify each language being spoken, which may be either modern, ancient or fictional. Perhaps too, for all I know, there may be hints to the meaning of this film in the multilingual dialogue. Or... maybe not. If anyone has an explanation for this movie, I'm all ears. (06 October 2008) As I continue to absorb this film, here's a comical movie review from New York Post. Apparently I'm not the only one that's confused by it.